1. Diversity of afterlife views. Yes, indeed, we are becoming more diverse (though not hugely so I think in the UK -- there tends to be an assumption that Christians believe in heaven and hell, some other religions believe in reincarnation, and most people are either agnostic or think death is final). There aren't actually too many options, really, in either the ancient or the modern world; just variations on well-known themes. I don't see the full Christian eschatology as the primary thing to talk about in evangelism. The primary thing is Jesus himself, and the vision of the loving, rescuing creator God we get when we focus on him. However, the vision of new heavens and new earth, and of God's project, already begun in Jesus, to flood the whole creation with his restorative justice, does indeed generate a powerful evangelistic message: not just 'you're sinful, here's how to escape the consequences', but 'your sinful life means you're failing to be a genuine human being, contributing to God's project of justice and beauty -- here's how the project got back on track, and here's how you can be part of it, both in your own life being set right and made 'something beautiful for God' and in what you do THROUGH your life, bringing justice, hope, joy and beauty to God's world as we look forward to the final day'... I'd better not go further or you'll get the whole sermon? Question 2--- There seem to have been at least two persons who saw the risen Jesus on or after Easter who were not amongst his disciples at the time---- James his brother and Saul on Damascus Road. One of these surely took place during the initial period of appearances, the other after those 40 or so days, which is to say after the Ascension. Yet they both claimed equally to have seen the risen Lord. In your view was either of these appearances to non-disciples visionary in character, and does it make any difference to your case that resurrection always meant something that happened to a body after death and the initial afterlife? 2. James, Paul and 'visions'. The difficulty here is that in our culture a 'vision' is thought of as a 'purely subjective' thing, so that when people say 'so-and-so had a vision' they assume there is no correlated phenomena in our own space-time-matter world. The whole NT is predicated on a different view: that heaven and earth are twin parts of God's good creation, and that they overlap and interlock in a variety of surprising ways, so that sometimes people really do see right into God's dimension and sometimes aspects of God's dimension -- in this case, the risen body of Jesus -- are visible from within our dimension. Question 3--- About half way through your book you make clear that Purgatory is not a Biblical doctrine, and that of course salvation is not a reward earned by good works. There does however seem to be both in early Jewish traditions and the teachings of Jesus and Paul a connection between good works and some sort of reward when the Kingdom comes on earth (not, it would appear, rewards of varying status in heaven, or years off of purgatory). What do you make of this, and passages like 2 Cor. 5.10 which speak of all Christians being accountable at the bema seat judgment of Christ for the deeds done in the body, whether good or bad? If salvation is by grace through faith, what do these rewards amount to? And is there no correlation between behavior in this life and getting into the eschatological Kingdom on earth later, as Gal. 5 would seem to suggest? 3. Rewards etc. As C. S. Lewis pointed out a long time ago, there is a big difference between a child (a) passing a French exam and being given a bicycle as a 'reward' and the same child (b) being given, instead, a month in Paris now that she is able to enjoy and profit from it. Not a totally accurate example but it helps: if the final state to which we look forward is that of complete humanness, fully reflecting God's image into the world, and if our faith, hope, love, fruits of the Spirit, meekness, patience, etc etc in the present are genuine anticipations of that, then the final state will be from that point of view the reward (b) will be ontologically connected with the preceding activity. Both Jesus' basic ethics and Paul's are eschatological, that is, they are based on the fact that the kingdom is already inaugurated as an act of sheer grace and looking forward to the fact that the kingdom will one day be consummated, also as an act of sheer grace, and celebrating the fact that what grace does is to enable failed, sinful human beings to be caught up in God's restorative justice so that, by that same grace active through the Spirit in their lives, and by their Spirit-enabled thinking through of what it's all about (Romans 12.2, etc etc), they are anticipating in the present some aspects at least of the full humanity which will be theirs at the last. Again, much more could be said, not least on how to retrieve the notion of 'virtue' from a fully biblical point of view. Joel Green and other NT scholars have been conferencing with neuroscientists and writing a good deal about how the mind is simply the software of the brain, and without the physical body, the whole person simply ceases to exist. In other words, they are advocates of some sort of monism in the form of the equation 'no body=no person'. I take it from many things you say in 'Surprised by Hope' that you believe in a limited dualism between body and soul, or body and personality, such that the person survives death and goes to be with the Lord, but that ultimately that dualism will be resolved when the resurrection of the body happens, and those in Christ are made like him once and for all. How would you answer the monists, who insist they have mind/brain science on their side? 4. I do think -- and at this point Aquinas, and the Greek Orthodox theologians, and the early fathers, agree with me -- that humans are incomplete without a body. However, I agree with theologians Jewish and Christian, ancient and modern, that if there is to be a resurrection that presupposes some kind of continuity between the embodied person now and the embodied person then. One way of 'solving' this might be to suggest that at death we are 'fast-tracked' straight to the eschaton; I don't buy that because the new world will be made out of the old one, not created de novo, and that clearly hasn't happened yet. Another way of 'solving' it is to say that God 'remembers' us, not just with a kind of nostalgic looking back at the person we once were but are no longer, but that he somehow holds us in life (as the Psalmist says) within his own being. Hence Polkinghorne's image: God will download our software onto his hardware until the time when he gives us new hardware to run the software again for ourselves. For me the telling points are Jesus' words to the brigand: TODAY you will be with me in Paradise -- though Jesus won't be raised for another three days; and Paul's in Philippians, 'My desire is to depart and be with Christ which is far better'. I don't think Paul could have said that if he'd believed it would be a non-existent state prior to the resurrection. Wisdom 3 of course uses the language of 'souls in the hand of God', which may be a way of saying pretty much the same thing. In a recent book on a Christian view of work, David Jensen says that we are not co-laborers with God, building the Kingdom on earth, but merely engaging in grateful responsive labor to the purely divine work. This seems to be an attempt to avoid suggesting that our deeds have something to do with our own salvation whether present or future or the coming of the Kingdom whether present or future. From the last section of your book Surprised by Hope, it seems clear that you think Jensen is saying too little, and indeed is wrong. Help us connect the dots between our future hope in Kingdom come, and our present work. Is it a mere foreshadowing of Kingdom come, or an actual foretaste, and so part of that work? Does what we do now, get perfected when Jesus and the Kingdom come in full? What does it mean to be co-laborers with Christ and why should that give us hope in the present as well as for the future? 5. We are not building the kingdom by our own efforts, no. The Kingdom remains God's gift, new creation, sheer grace. But, as part of that grace already poured out in Jesus Christ and by the Spirit, we are building FOR the kingdom. I use the image of the eleventh-century stonemason, probably illiterate, working away on one or two blocks of stone according to the orders given to him. He isn't building the Cathedral; he is building FOR the Cathedral. When the master mason/architect gathers up all the small pieces of stone at which people have been working away, he will put them into the great edifice which he's had in mind all along and which he alone can build -- but FOR WHICH we can and must build in the present time. Note 1 Corinthians 3, the Temple-building picture, and the way it relates directly to 1 Cor 15.58: what you do in the Lord is NOT IN VAIN, because of the resurrection. I have absolutely no idea how it might be that a great symphony or painting, or the small act of love and gentleness shown to an elderly patient dying in hospital, or Wilberforce campaigning to end the slave trade, or the sudden generosity which makes a street beggar happy all day -- how any or all of those find a place in God's eventual kingdom. He's the architect, not me. He has given us instructions on the little bits of stone we are meant to be carving. How he puts them together is his business. Excellent interview, great questions, great answers. I appresiate you taking the time to do it and post it for us to read. 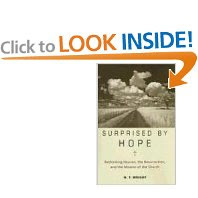 I'd agree with your assesment that Suprised by Hope is an instant classic. I'd be interested to hear if you think systematics might take a similer slant in years to come? At the moment most systematics I read just contrast millenial and tribulational positions, with very little attention to the sort of grand new-creation end game portrayed in Wright's book amoung others. Thanks for sharing. As I read I heard echoes of my own discussion of these items in the course on Revelation I teach at Manhattan Christian College. I really appreciate the viewpoint of Wright. This is a great gift that you would give us Dr. Witherington-a conversation/interview between two of the first rate evangelical scholars in the world. Thanks so much. To hear the questions your asking and to see the responses Dr. Wright gives is so cool. Please consider doing this with other scholars you know or interact with. It's also nice that the post is concise and readable. Thanks again! different to me than the traditional living as a Christian should. Thank you - what a terrific sequence of questions and answers! I'm reminded of Proverbs 24:26 "An honest answer is like a kiss on the lips." I was particularly struck by the careful distinctions Dr. Wright makes in his discussion of Paul and the possible nature of his vision of the resurrected Jesus (question 2). It reminds me of the devastating "vision" of God that the prophet Isaiah recounts in Isa 6. Also, did you note that Dr. Wright's seems to come down on the side of "sheer grace" in answer to your Question 3? The Christian life we live now is connected to the future life but not "as reward." Of course, his answer to that question does not attempt to be complete, but it does relate to the blog discussion we all had on Dr. Wright back in February. Hi Pennoyer: That's not quite what Tom says. Yes, says Tom there are rewards in the Kingdom, no says Tom the Kingdom itself is not a reward but rather sheer grace. That is, our works now do matter, do count in the Kingdom, even count personally, but they themselves do not save us. Being raised from the dead, and being conformed to Christ's image is a unilateral act of God. Note the analogy he draws with what C.S. Lewis said. Renewed earth is the sequel to the interim time in heaven, and as such is far different from equating the present state called heaven with the new heaven and new earth. But Dr. Ben, can't we equate heaven with new heaven and new earth? In What Christians Really Believe the late Stanley Grenz was making a point that it may be better to use the term new creation instead of heaven. So I have been thinking that new heaven and new earth/ heaven/ new creation are all the same. And can't we call that intermediate stage as paradise instead of heaven? Regarding question four, God's time is different from our natural, human time, which will come to an end. Whe we die we enter God's Eternal Now where the renewed earth and our resurrection bodies exist. They will be manifested in natural, human experience at the end of the space-time continuum. What is wron with a two-dimension solutuon? Well, my interest is really in what difference there is supposed to be between new heavens and new earth and the traditional heaven. That is, supposing new heavens and new earth isn't just like old earth but without the bad bits like stubbing your toe, and heaven is not just lounging around on clouds with harps. Firstly, if by heaven you mean the eternal dwelling place of God which existed prior to the creation of the heavens and earth, then no... you can't equate heaven with new creation or the new heavens and the new earth. The latter refers to a material realm, transformed or made new by God. Heaven, is not a material realm. This is precisely why Paul says in 2 Cor. 5--- that he will be absent from the body and present with the Lord when he dies. Secondly, the Bible absolutely does not affirm the notion of the Eternal Now, as opposed to time being infinitely extended in heaven. Notice how the saints under the altar in heaven ask God "How long O Lord". No, heaven is not a place where there is no procession of what we would call time. And as to how the new creation will be different from dying and going to heaven. Much in every way. We will not have bodies of any kind in heaven. Resurrection is what happens when Christ returns to earth, not something that happens in heaven. latter idea is much more in need of challenging. What Paul says about the resurrection body is clear enough in the way he compares and contrasts it with our present mortal bodies in 1 Cor. 15. The continuity is that in both cases there is a material body inhabited by you. The discontinuity is summed up by saying that our current bodies are weak, that one will be strong or powerful. Our current bodies are mortal, that one will be immortal. Our current bodies are inglorious, our res. body will be suffused with glory, i .e. the living presence of God. It will a body completely enlivened by the Spirit of God ('spiritual body' is an incorrect translation of what Paul says there). In short, we will be immune to disease, decay and death. The prophets envisioned the kingdom come on earth as in considerable continuity with this life at its best--- see e.g. Is. 65.17-25. What they envision is a war stoppage, not a work stoppage. Permanent retirement is a modern myth. Ben, your answer is very proper and correct, but is not to the point. The point is, why is it enthralling for people to be told their destination will be a new earth rather than heaven? Wright actually offers people a new earth experience that is no different than they already thought things would be like in heaven. Except for those who thought they would have the 'beatific vision', who might be expected to be disappointed. Isn't the real attraction of Wright's ideas a dangerous triumphalism people are being offered about what difference they can make to the world now in working 'for the kingdom'. Lets be clear. Wright is not saying, its an either or thing. One dies and goes to heaven, and then eventually there is new creation thereafter. I see no danger of triumphalism in saying that the work we do that is good and godly in this life, matters to God, it is not done in vain. It has an eternal purpose. Wright distinguishes between building for the Kingdom and building the Kingdom, and I find that perfectly adequate. God will take our small offerings and incorporate them into something far greater and more beautiful. Hi Ben, Oh dear, we are still talking past one another! Let's say, pre Wright people thought before death they should act as Christians should. After death, they were thinking they would go to heaven and there be no second place like new earth coming along to then be in. Comes Wright, who says people should act somehow differently before death, on account of it not being heaven they are going to in the end but new earth. I can't see that they should act differently in either scenario. Comes Wright, who says it makes a difference in how things will be after death whether people are going to heaven for good or (first to heaven and then) new earth. I can't see there being a difference in what things are expected to be like by people whether they think they will be in heaven for good or whether they think they will be on the new earth. Thus, I think people enthusing over Wright must be expecting things to be different now, not after death, in his scenario. This seems to me to be a triumphalistic scenario rather than a simply acting as Christians should with actually every expectation things won't go particularly well. Davey lets take an issue like ecology and concern for the environment. If this world is simply heading for oblivion, and we finish the race in heaven. Then not only is there not much incentive for us to be conservations, God himself is not a conservationist. But on the other hand, if it is part of the creation mandate to tend the garden and care for it, as in fact there is, and if in fact part of the reason for this is that we are preparing to live forever in such an environment, then there is some point to "the conservation of matter and energy". There is in fact a clear connection between Christians who are concerned about going green, and what they believe about the afterlife, here on earth. I don't really see how this qualifies in any way as triumphalism. Why in the world wouldn't God want what we do in this life to matter in eternity? But as Paul says in discussing the future resurrection in 1 Cor. 15, it is precisely because of that resurrection that our work in the Lord in this life is not labor in vain. Ben, feel free to call a halt anytime on these exchanges, but you do not seem yet to be engaging with my points. I agree there is 'a clear connection between ... here on earth', and am disconcerted by it. My concern is with the justification of Christians holding that connection, and their expectations of its outcome. Of course we should care for the environment, but because we should be variously caring people, not because we think the environment will continue forever. Are you suggesting we should plant a tree now in the expectation that that tree will exist in the new earth, and that if we don't plant the tree the new earth will be missing a tree? I would want Wrightians to spell out what sorts of ideas they have about the new earth. They seem to think it will be just like now, but without bad bits. That the new earth will be a mere transformation of whatever the earth looks like at the time of its transformation. If it is a mess because of global warming, it will still be a mess only a beautified mess, for instance. If the tree gets blight despite our best efforts, as things do in this world, will it be a beautified blighted tree still? So, just how in eternity will our present efforts matter? I think that however the new earth will be there is no big deal in telling people their thoughts of spending eternity in heaven are in need of urgent correction, and that the idea of the new earth is enthralling and life changing. Perhaps one thing I'm wanting is some more imagination being exercised. Wyatt I do think the 12 are representatives to Israel, but here is precisely the point---JESUS ISN'T ONE OF THE 12. He is not Israel and the 12 are not ministering to him! They are sent to the lost sheep=Israel which is someone other than Jesus or the 12. You can find this in my Matthew commentary or if its Paul's version of things in my Romans commentary. Also in my Jesus books-- Jesus the Sage, and Jesus the Seer, and the Christology of Jesus. I think davey's questions and points are quite cogent. Davey I think the images from the prophets are a perfectly good answer to your question. No, it was not be a transformed mess, it will be what it was intended to be in the first place, starting from the Garden of Eden. Read the description in Rev. 21-22 which is not a description of life in heaven, but rather of heaven and earth. I think Tom is quite right to be reluctant to speculation on precise details when the Bible does not give us such things. What we know from Romans 8 is that all of creation has been subjected to the Fall, but in hope of liberation. Resurrection would be pretty pointless if we were just going to be new creatures in a pretty but pretty worn out earth. And as for if I plant a tree now will it be there in the Kingdom, my response would be--- why not? I think Tolkien's vision of old earth is in some ways suggestive of what new creation could be like. expected in heaven or new earth. Also that there should be no difference in how people should conduct their lives whether their destination is heaven or new earth. And my response to that is--- unless you are a Gnostic, a disembodied state could never be equal to an embodied one. Human beings are bodies with breath in them. To be less than that, to be 'absent from the body' as Paul puts it, is to be naked in the presence of God-- a mere human spirit in the presence of God. Frankly, I don't see how that holds a candle to having a resurrection body in the new creation. We are not full persons apart from a body, which is precisely why heaven is only an interim condition. God wants us to be all that we can be, and all he originally intended us to be, and that frankly is not possible in a disembodied state in heaven. Kapish? eternity has nothing valuable to people missing from it. This seems to me the standard view of heaven. (I suppose your view is of some intermediate state before eternity that Wright speculates somewhat about, so it is not to the point.) New earth will have to be so different from present earth as to make it equivalent to the standard view of heaven. The question remains, why would people who would generally have the standard view of heaven be so enthused by Surprised by Hope? Enjoyed it, thanks for sharing. I also agree- it's a classic. First of all, thank you Ben for this excellent interview. I loved SBH, and I really appreciated Tom's wonderful summary in answer to your first question. I also appreciated your own comments on the Hellenistic fallacy of God being outside of time, and your beautiful notion that "The prophets envisioned the kingdom come on earth as in considerable continuity with this life at its best--- see e.g. Is. 65.17-25. What they envision is a war stoppage, not a work stoppage." Regarding your back-and-forth with davey, I would only add that for me, the most exciting thing about the "new earth" concept as Wright is proposing it, is that it's Biblical! I am frequently frustrated by the preponderance of extrabiblical notions in both theology and popular conceptions of God and Jesus. Whether or not the notion of new earth is ontologically "better" than the notion of heaven is somewhat beside the point if it's Biblically more accurate. That said, I do affirm with davey that we're called to the same obedience either way. . .
Hi Davey: Thanks for all your thoughtful posts. Here is where I tell you in closing that you are wrong about the 'standard' view of heaven, and that includes the NT view of the same. It is always viewed as less than an embodied existence, and therefore less than a fully human or satisfactory existence. In response to the string of comments with Davey , about whether there is any difference between heaven and the new creation let me offer a paragraph from a sermon that I gave entitled "Better Than Heaven." Some of this is a little corny -- but I pastor in the rural south. "The Bible teaches that there is life after life after death – but that there is an even more glorious life in a more glorious promise -- a new creation. Think of what we will miss and what we will have if the future is a new earth that is in some fashion continuous with the present creation. I want to always know the feel of a babies head – and I will if our destiny is a new creation. I want to always love to hear the sound of a happy laugh - and I will if our destiny is a new creation. I want always to be amazed by majesty of a mountain range -- and I will if our destiny is a new creation. I want always to be delighted by a spring breeze -- and I will if our destiny is a new creation. I want always to hear the voice of one I love calling my name. -- and I will if our destiny is a new creation. and I will if our destiny is a new creation. I want always to hear the turkey call in the spring"
Having tracked NTW since the late '60s, I have admired his ability to connect with those with whom he differs. One of his main current challenges with conservative evangelicals appears to be that of pointing out to his opponents that he does not differ in "order" but in "degree"; AND the degrees matter! The new creation emphasis produces a powerful antidote to "disincarnate" spirituality which gravitates so readily to disembodied egocentricity (nous-mind-centricity) as over against bodysouls being taken up in theocentricity, and delighting to be part of the big story. In relation to the charge of dualism - I seem to recollect that NTW describes the soul as the whole person as known by God. The Polkinghorne "software/hardware analogy (thought useful) omits the concept of personhood and the preserving care of the beloved by the Great Lover. Thank you for the interview. Given the role that NTW has taken on/been offered, clarifications and expansions are essential in order to minimize the propagation of myths! 1) Because the Bible teaches a 'new heaven/new earth' scenario, and does not teach that when we die, we go to heaven, and that's it. Even if the model made no difference in Christian praxis, it would still be appropriate for us to embrace what the Bible actually says about our future as opposed to current popular notions accepted by many Christians today. If we act as though a current widespread misunderstanding of an important biblical doctrine is not such a big deal, I don't see how that's honoring to the God we serve. 2) Because it really does affect the way many Christians view their walk with God, their vocation, their place in the body of Christ, etc. Yes, there are many Christians who believe that we go to heaven for eternity, who still carry out wonderful ministries. I myself was involved in various ministries long before I understood this 'new earth' stuff. But as someone who was raised in a strict fundamentalist 'KJV only' setting, I can tell you that there are indeed many Christians who become so preoccupied with the rapture, with being taken out of the world to go to heaven with Jesus that all that matters is 'saving souls', and no emphasis is ever made on helping the poor, being wise stewards of creation, etc. Maybe you'd say: "Well obviously they're misunderstanding the purpose of the gospel." I would respond: "Exactly." And the gospel, as the NT reveals it, has a lot to do with resurrection and the restoration of creation. 3) Because knowing that 'our labor in the Lord is not in vain' can make our experience in the present much more fulfilling, satisfying, exciting, etc. I always used to wonder why it made any difference what I did in this world, not because I didn't want to do good, but because I felt like it was pointless. But seeing that the NT explicitly declares that how I obey God in the present has real, eternal effects fills me with more excitement and motivation to obey God than I ever had when I assumed that, one day, the world would go to hell and God would take us away to heaven. I should add that your concern about 'triumphalism' is exactly one of the two mistaken viewpoints that Wright interacts with throughout the whole book. Have you read it? In response to the dialogue between davey and BW3. One of the things that NTW notes as a major difference between "heaveners" and "new-earthers" in "Surprised by Hope" is that if our eternal hope is a disembodied heaven then physical death has not truly been defeated, but merely redefined. The notion of eternity in heaven, I think NTW is trying to say, ignores the reality that Christ actually conquered the grave. Do you know of any written works that develop a fully Trinitarian creation/new creation sequence? The late Colin Gunton pointed out that Irenaus was the best writer on this topic. Perhaps if we had developed a fully Trinitarian presentation of the original good creation, we would not be struggling in the same way with NTW's re-focus on Trinitarian (re-embodied) new creation! Wright mentions that the risen body of Jesus was seen by His disciples. He mentions it as if they were seeing into the heavenly dimension. How does this avoid the same problem we run into when we speak of others having bodies in heaven? Also, if in some way Jesus is not "fully embodied", then how does he escape the "limited" form of existence of which you speak? If you say it is because he is divine, in what way is he still demonstrating his "human-ness"?